So sorry that it took so long… there have been a load of adjustments that kept delaying him, but he is finally due for release! The Nendoroid boxes are slowly getting bigger and bigger… I guess it’s really just a sign that they are getting more and more parts to play with! So let’s take a look at Mickey! The stand is one of the stands that presses into the back. His little tail is also 360 degree posable! Mickey found some smoked cheese! 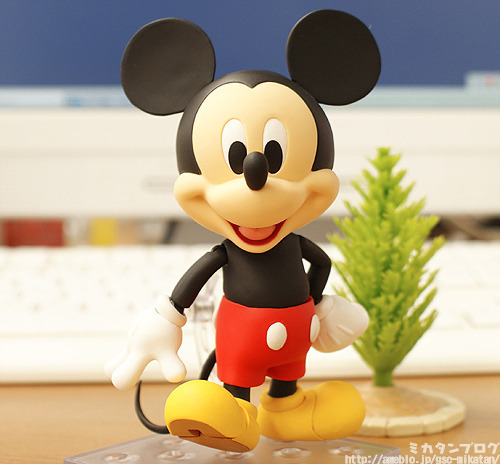 Mickey isn’t quite fully posable, but he is still very posable! His shoulders, thighs and even the tip of his feet are fitted with joints. First up is his director’s chair! 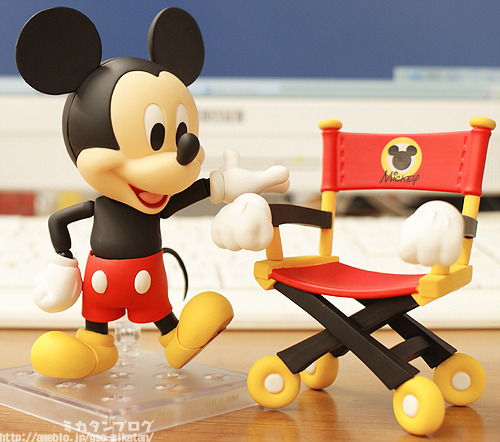 The armrests look like Mickey’s hands and the backrest features a ‘Mickey’ logo. It’s such a simple design but it looks great and suits Mickey nicely. He also needs his camera! 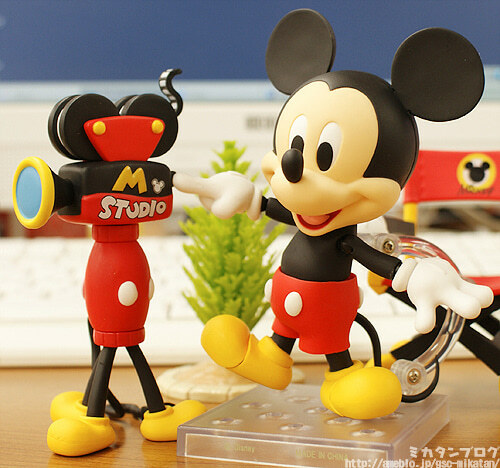 The camera also features a design that suits Mickey really well – the film on the top looks like his ears… it’s so perfect! Next up is his megaphone! All these little parts bring out Mickey’s world for you to enjoy! Obviously he also comes with hands to hold the megaphone. 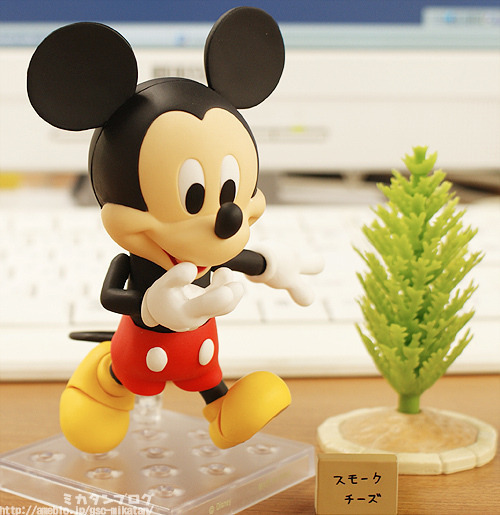 Don’t you think Mickey looks adorable from the side-view? I really like this angle! Last but not least – his clapperboard! Once again it is styled to fir into Mickey’s world perfectly! The full set of filming tools! 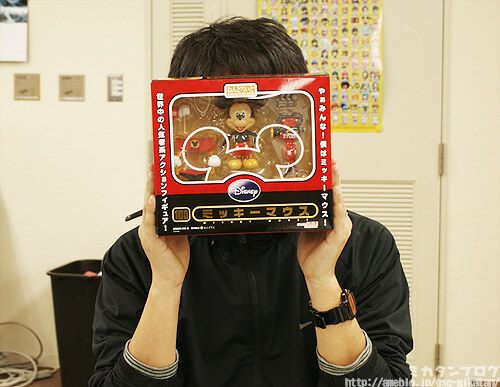 These were actually drawn by Disney Japan especially for the Nendoroid!! He decided to have a chat with Teddy! But instead he does have replaceable eyes! When you want to change the eyes you just pull of the skin-colored part on his face – you don’t need to remove the head at all which makes it really easy! 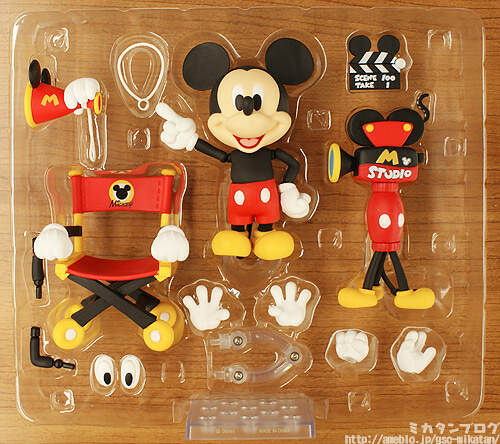 If you’re a fan of Mickey then you’ll have great fun posing him in some of your favorite scenes! He’ll be on sale at our partner shops from tomorrow! For questions or ordering details check out our partner shops. We managed to get a signature from Mickey himself!